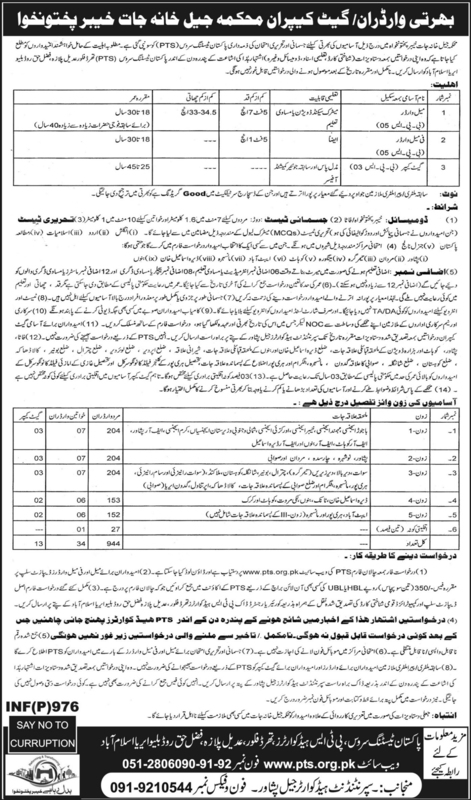 Government of Khyber Pakhtunkhwa, Prison Department has announced 991 New Job in Daily Mashriq Newspaper Dated 27 February 2018. This Recruitment for Army/Military/Police Jobs KPK 2018 is processed through Pakistan Testing Service (PTS). Candidates can send their application form for Male Warder, Female Warder and Gatekeeper within 15 days of publication of this advertisement to the Pakistan Testing Service (PTS) 3rd Floor Adeel Palaza Fazal Haq Road Blue Area Islamabad. Examination Center will be in following Cities Peshawar, Mardan, Teemergrah, Mangora, Kohat, Abbottabad, Mansehra, Dera Ismaeel Khan and Bannu.